Burt Lake's sought after west side living at its finest! Wake up with your morning coffee and watch the sunrise. Beautiful location and view are to be enjoyed here! Three bedroom condo comes with a dock that allows you to enjoy Burt Lake and all of 42 mile Inland Waterway! You have access to four lakes for the price of one! This is a great location for those coming up for the weekend. Just minutes from I75. 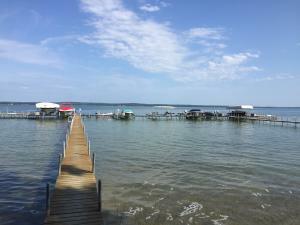 Short drive to Mackinaw City, Cheboygan, Petoskey and Harbor Springs! For the nature lover, there is a bike trail just across the road. The snow mobile trail system is nearby as well!Currently rented. Makes a great investment property. Natural gas has also been ran to the condo.This is the perfect location to enjoy Northern Michigan!! !